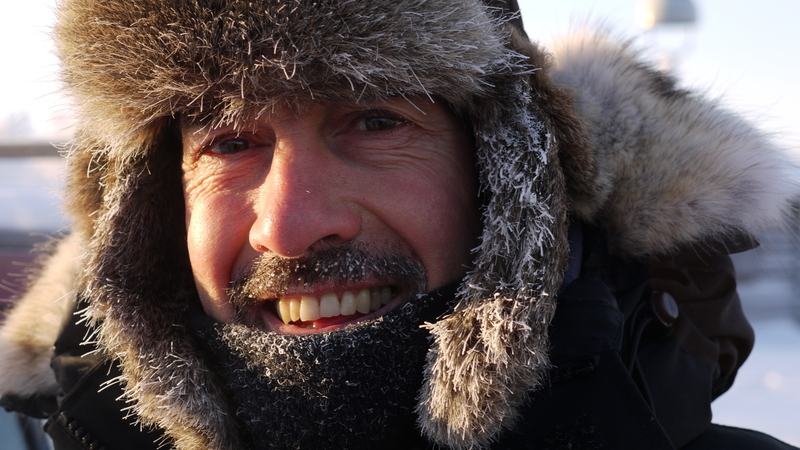 Well, I’m certainly not an expert on cold weather, having lived through only a part of a Yellowknife winter (although already the coldest one in 15 years), but I’ve learned a great deal about it these past few months, and I’ve one secret – I can be out skiing in minus 40, and not feel the cold. Now I’d like you to believe that I am a tough, hardy northern woman who laughs in the face of ice and snow and wind, but the reality is, I’m just dressing right. It’s true – if you dress properly, you can be quite comfortable outside in any kind of weather. It’s about space, natural fibers, and pacing yourself. In fact, this could be a lesson for many things in life. The biggest thing is to have loose fitting clothes, boots and mitts. Anything that is snug, and doesn’t allow for an air layer between you and the fabric will feel cold. Who knew that less could be more? This apparently also applies to long underwear. One friend here swears by her Scandinavian mesh underwear ( photo below). The idea of course is that there is an air layer between your skin and your clothing, hence the warmth. Natural beats man made. One of the interesting things about winter attire up here is how the old ways still prevail. The way people dress is still based on the Inuit and Dene way of doing things. Fur is an incredible insulator. The best mitts around are beaver fur. They may have a bit of synthetic liner, but they don’t have insulation per say. Yet, they are warm and light. They are generally loose, and have a long string attached, which goes around the neck – like the ones that 5 year old kids wear. The beauty of this arrangement is that you can easily slip off the fur mitt and use your hands for tasks requiring dexterity, like adjusting a dog harness, then easily slip your hands back in for warmth, like when you are hanging onto the back of the dog sled. The other way that fur excels is as a wind barrier. A mitt with a fur trim or a hood with a fur trim will not let any cold wind in. 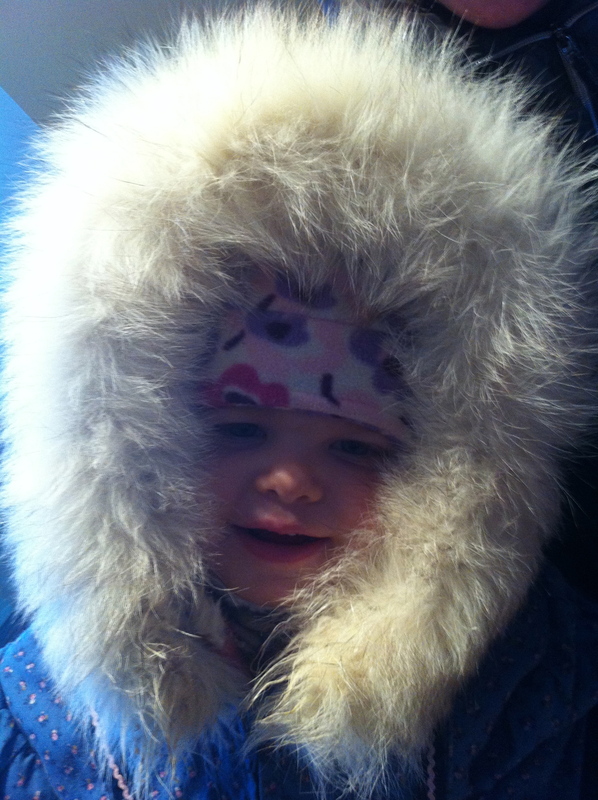 In fact our beautiful Canada Goose parkas have coyotes fur trim on the hoods. And this can fold out and extend the hood some ten centimeters or so to create a tunnel around the face to keep the wind out even more. And the right kind of fur, traditionally wolverine I think, does not ice or frost up either. The women used to wear long cotton overdresses with a fur trim at the bottom. This served two purposes – to allow the women room to stride widely, and yet the fur kept the wind out. Ingenious. These are still about as well, although not common. 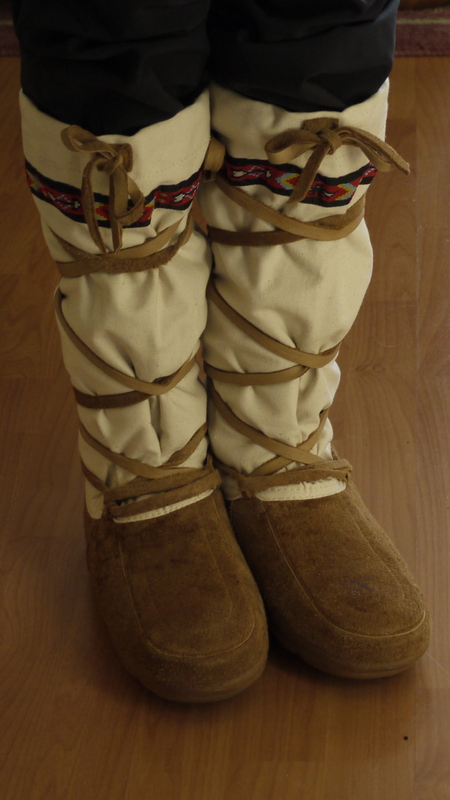 Many people here wear the traditional sealskin boots too, with incredible bead work. As one friend said, the budget for her boots came out of the art budget, not the clothing budget. Well made, they are almost too beautiful to wear. The other boot one sees everywhere are the Steger brand mukluks. These are very loose fitting felt lined boots, with canvas tops and moose hide lowers. Supposedly the warmest boots in the world, you buy them 1 or 2 sizes too big, to allow for that all important air space. They are light and comfortable, like wearing a bedroom slipper. This is the northern equivalent of barefoot running! They really work. Now I can go outside with warm feet when its minus 30 or more. The parkas are important of course, not just for the fur trim and warm hood, but also because they are long and come to mid thigh at least. That is important. And wearing insulated pants is a must too. And a neck tube, even the thinnest cotton one. And a face mask if its below minus 30. So, I’ve mastered the basics. But it gets even better. My friend J was telling me about her ‘camping mink’ the other day. 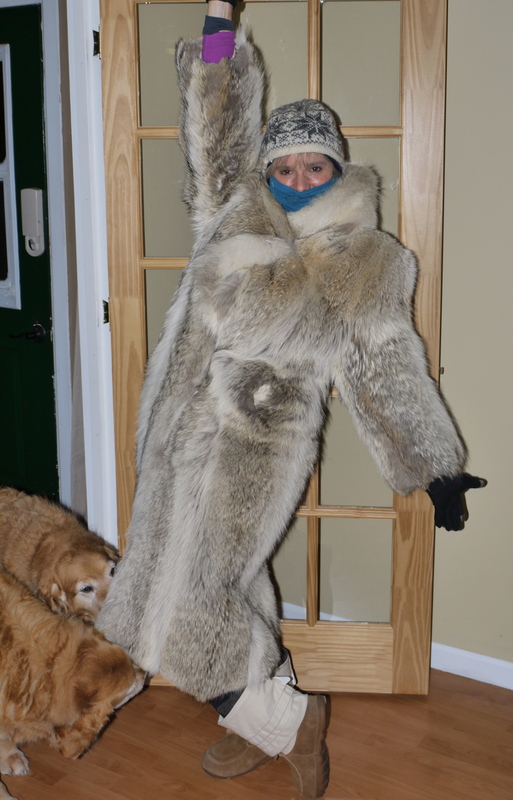 This is an old mink stole, which she puts on when waking up in her tent in the morning, and which keeps her warm while dressing and moving about the tent. I asked her where she got it and she said, ‘just get your grandmas’ old one’. Now, my grandma didn’t have a mink stole, and she is also a wonderful grandma, so I’m not about to trade her for a grandma with a mink stole. Apparently another option would be to check out the second hand stores, where mink can be easily found, as it’s not politically correct to wear these days. I used to think that way too, but up here, it’s different. Here it seems a way of honoring the traditions and wisdoms of a smart and tough race, the first people to live off this land. J with camping mink, and matching mesh underwear. Apparently so warm pants are not required! If you see the stove pipe on Jenn’s tent, you’re realize it has a stove inside. The Arctic Dome – of course I want one. Garage sales are huge up here, and now I can see why. Imagine finding this beautiful and warm coat for next to nothing. Even the dogs are fascinated. 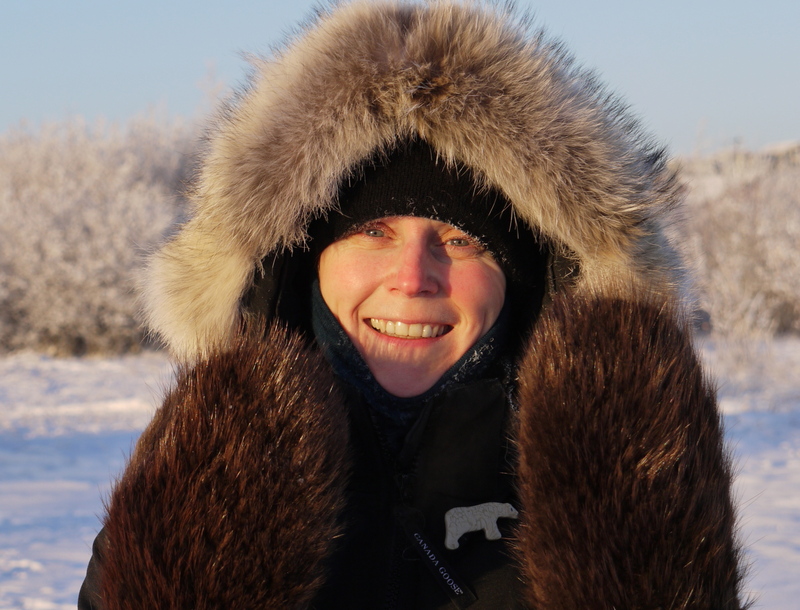 Sealskin coats are also popular, and stunningly beautiful, with the natural markings on the fur. Alright, enough chatting. 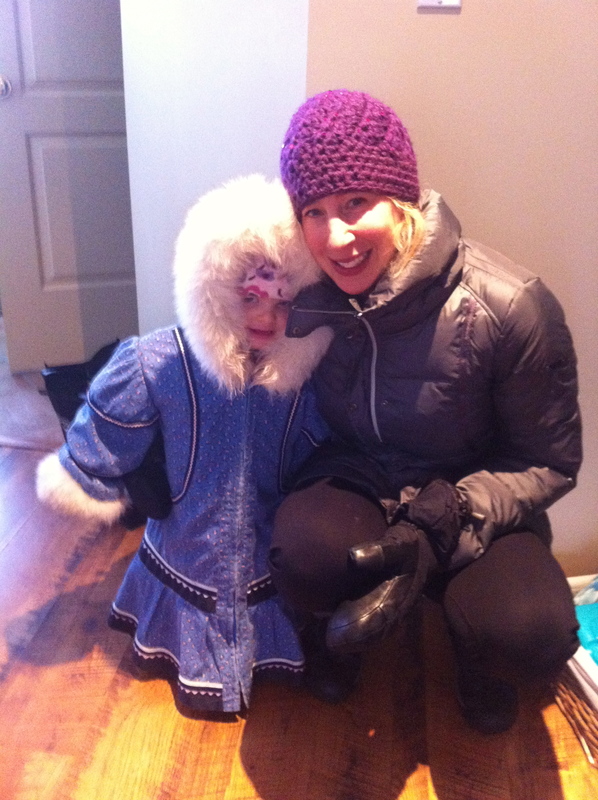 Time to go test my dressing skills with a snowshoe in minus 40. It’s too cold today for the propane to flow, I can’t bake cookies so I’m heading out instead. 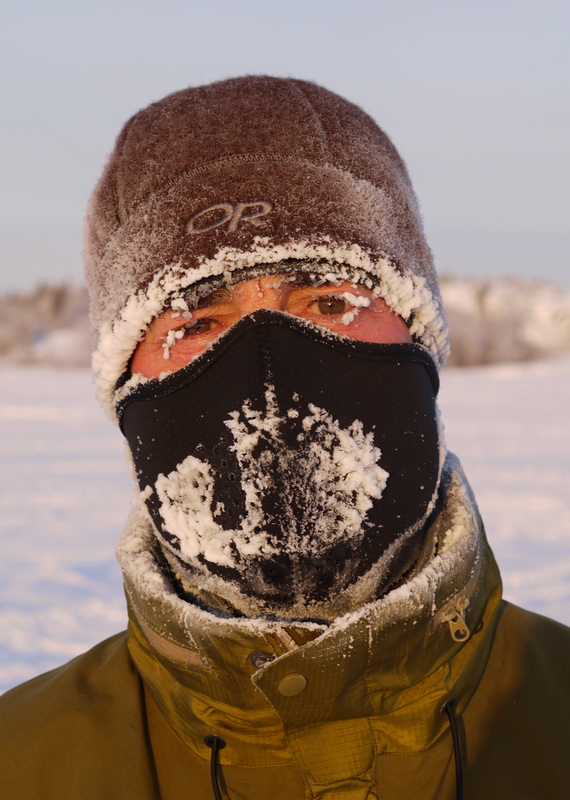 This entry was posted in North of 60, photos and tagged arctic fashion, its cold!, tradtional clothing, winter. Bookmark the permalink. Hi: Seems like the clothing styles are just what I need and love. Warmth over beauty. Not impressed with your -40 but love the clothes. It certainly is all about the “dress”. Glad you are figuring it out. The photos are FABULOUS! Pingback: » This is what happens when you Friday Links Woman. Legend. Blog. Nope, I am not your mother. I’m pretty sure I would remember a daughter I named after a strawberry. But I did love the intro on your blog telling the story. I am curious to know what you might look like if you did fully grown into your name! Loving your outfits! I would like to request a guest post from Grandpa George and Grandma Karen on their experience up there. Great idea, I will set that up! A Calgary friend of a friend of yours sent me the link (as I moved to Yellowknife last June) – well written and great pictures! Hope we run into each other some time. I’d love to run into you! You can find my email by clicking onto my gravatar image, the photo of me to the side. Thanks for your visit, and your comment. I don’t know who it was who said all families are strange in their own way, but its true of weather too. All weather is harsh, in its own way. Scottish rain is not to be sneered at I am sure! And its almost 50 degrees near Sydney Australia this week, which I am sure is more of a challenge than this cold. I think I may start keeping a list of my favorite and most terrifying sentences from your blog. “Too cold today for the propane to flow” qualifies, I think. Love your coyote fur coat!! !